Formally started from 2016, the 3-year project EVENT is co-funded by the ERASMUS+ Programme of the European Union aiming at capacity building in selected HEIs in Vietnam with close professional cooperation and supports of European partners. The main objective of the project is to increase employability of university graduates in Vietnam. Due to the lack of information on the real state of employment of university graduates the project intends to perform a detailed tracer study at the partner universities. The data collected in such a study would then be examined by all partners and the outcome would be fed back to the curricula designers. This could potentially help us identify the areas where the academic education offered by our partner universities is askew with the demands of the labour market. Once EVENT has begun getting data from the tracer study, the project plans to hold a meeting with the Ministry of Education and Training to offer its methodology to other universities in Vietnam, inviting them to do the same. This will potentially assist in bridging the gap in the mismatch between education and work. One of the most cited causes for graduate unemployment in Vietnam is lack of soft skills in recent graduates. Another objective is to design and host intensive workshops for teachers and educators in our Vietnamese partner universities, raising the awareness of the particular skills reportedly lacking in Vietnamese students. Project experts are currently implementing models on how to reach both students and university management within partner universities on the topic and have stressed the importance of raising awareness not only with university teachers but also at the level of university management as well as with the students. EVENT therefore aims to set up meetings with all the specified target groups, relying on data from the tracer study, in order to create a permanent place for soft skills development at partner universities. 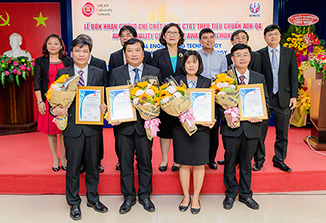 In order for EVENT to work towards its ultimate goal of increasing the employability of graduates in Vietnam, the project needs to rely on a collaboration between partner universities and the industry. Therefore, it has included the Institute of Labour Science and Social Affairs in the project. With the support from ILSSA it is strongly hoped to be able to involve representatives from the labour market in all project activities. Selected as the Vietnam Regional Coordinator for the project, HCMUTE has a great chance to not only follow up well with but also contribute to the smooth implementation of the project. Furthermore, international academic cooperation between the university and other partners thanking to this meaningful project is strongly expected.